You are currently browsing Ben Chapman’s articles. -At least 6 people who consumed raw or undercooked chicken livers, mostly chicken liver pâté have been infected with Campylobacter in Washington and Oregon. – A recent study found that about 77% of raw chicken livers are contaminated with Campylobacter. – Multiple outbreaks of Campylobacter infections linked to chicken livers have been reported in the United Kingdom and Australia. – At least 13 individuals who ate at a barbecue event were hospitalized with symptoms including abdominal cramping, diarrhea and vomiting. – All preparers should know safe cooking/cooling temperatures and procedures. Hold meals and ingredients requiring temperature control either below 41°F or above 135°F. – Purchase ingredients from commercial food businesses instead of homemade/donated foods and ask about food safety systems for suppliers. – Community dinners can be great fundraisers but are often held at temporary sites and staffed by volunteers unfamiliar with safe food handling practices for large meals. – Clusters of illnesses in the midwestern and eastern U.S. As of August 3, 2013: 400 ill, 21 hospitalized in 15 states, including IA, TX, NE, FL, WI, IL, GA, MI, AR, CT, KS, MN, NJ, NY, and OH. 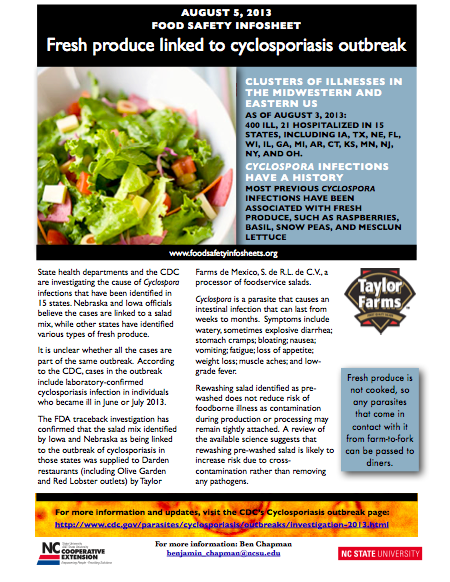 – FDA traceback has linked some of the illnesses to salad mix supplied to Darden restaurants (including Olive Garden and Red Lobster outlets) by Taylor Farms de Mexico, S. de R.L. de C.V.
– The virus can be introduced into a site by ill patrons or food handlers and can remain on surface for weeks. – Proper handwashing, excluding ill staff (for at least two days after disappearance of symptoms), and properly cleaning and sanitizing after vomit events can reduce risk. – Two 2010 outbreaks of norovirus were linked to an Auckland, New Zealand caterer and eventually traced to one food handler. The individual had been ill with norovirus and prepared meals soon after recovering from symptoms. – Don’t handle food while ill; especially if you have symptoms like diarrhea (when transmission is likely) or vomiting (as virus particles may be spread to hands, clothes and other surfaces). – Storing low-acid foods in a jar and sealing them without either acidifying or processing using pressure creates the ideal conditions for toxin formation. – In 1977, 59 patrons of a Detroit Mexican restaurant became ill with botulism after consuming improperly canned peppers after restaurant staff put lightly-cooked peppers and water in jars and sealed them. 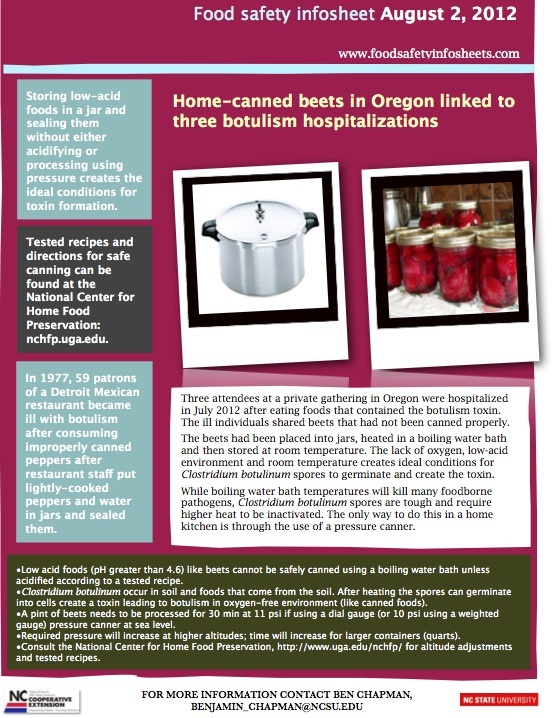 – Low acid foods (pH greater than 4.6) like beets cannot be safely canned using a boiling water bath unless acidified according to a tested recipe. – Over 20 customers of a California pizza kitchen restaurant were ill with vomiting, diarrhea, cramps and nausea. – Three food handlers were also part of the outbreak. – Unless noted on packaging, treat tempeh as a raw food. – Knives, cutting boards and other food contact surfaces must be cleaned and sanitized between preparation and use with ready-to-eat foods. 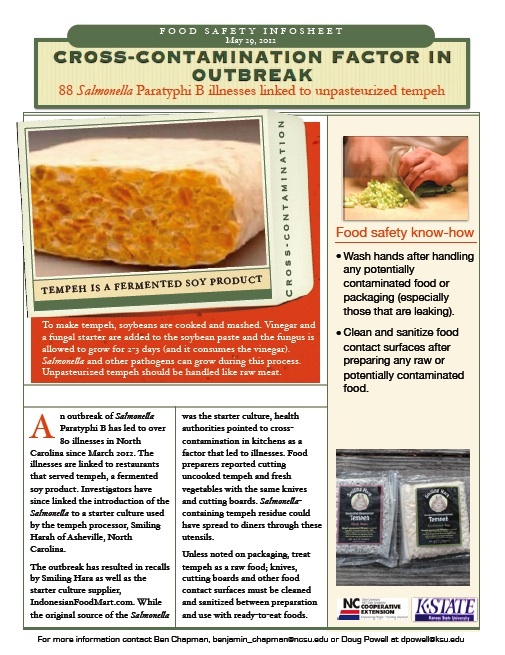 – Salmonella and other pathogens can grow during the tempeh production process. – Wash hands after handling any potentially contaminated food or packaging (especially those that are leaking). – Among the 166 illnesses are 12 hospitalizations. – The implicated product, processed and distributed by Moon Marine USA Corporation (also known as MMI) of Cupertino, Calif. is made of tuna back meat, which is scraped off the bones and looks like ground product. – The product is not available for sale to individual consumers, but may have been used in food service and retail to make sushi, sashimi, ceviche and similar dishes. – Moon Marine USA Corporation or MMI and Nakaochi Scrape AA or AAA were printed on boxes of the product when it was initially sold to distributors. Boxes may have been broken into smaller lots for further sale. Click here to download this foodsafety infosheet.